This is my study painting of an incredible photo made by @hiddenblade. As soon I saw the photo it struck a chord in me, but I couldn't pinpoint the reason why right away. So I decided to do a study and take a closer look at the hypnotizing composition. The image has a very mysterious and has somewhat haunting atmosphere. While doing the painting I also felt inspired to write a short story. I hear soft rustling sounds in the distance, growing louder, creeping closer. My heart beats in my ears as I hold my breath. Red spots are flashing and floating before my weary . I see nothing in the darkness enveloping me and I try to get up, but to no avail. I recognize the tickling grass on the back of my neck. The sound, or is it more sounds? Either way, it is coming too close and it feels rather familiar. I grab around in the dark, seeking for anything, to pull myself up. Unexpected pain pricks my hand like several needles. I pull my hand to my lips and taste blood, warm, metallic. My eyes have finally adjusted to the starless night. I realize now that those weren't red flashes around me, but lovely roses. There are so many everywhere. While awing at the sea of the red bloom and suddenly I feel a heavy weight lift off my chest. I scramble up to my feet. I run in the opposite direction of the enormous shadow of the snake that has slithered up so close. My feet feel light almost floating through air. The snake is still following and yet my fear is gone. I will survive and get to safety. The maze goes on and on, leaves are rustling everywhere without any sign of wind. I try to jump to see over the bushes, but they are just above my head. I slow down to a pace and continue walking calmly, listening to the nothingness. The smell around me is so fragrant and beautiful. The maze opens up into a vast emptiness. I cannot see ahead or even right in front. I reach out, but feel no difference. The title is simple, but it allows the story to be somewhat supernatural without needing additional explanation. Also we commonly associate dreams with symbolism. Running away in a dream is linked to avoiding problems in real life. Roses symbolize love and passion, whether it be a person or something else important to us. The little bit of blood can stand for life while darkness can be associate with unfamiliarity or inner spiritual world. Snakes in a dream can symbolize a difficult situation, but also healing. I specifically chose a snake, because I often have snakes in my dreams. My most common theme in dreams is running/ being chased, or food. Fancy sweets that I never get to try!! What is your most common dream? I intentionally used present tense, more commonly used in **poetry **than stories. The purpose is to pull the reader into the story, but this writing style also adds a sense of unease in the readers, because we are used to reading stories in past tense. Moreover, I had to constantly proofread the text as I kept automatically writing in past tense. The following is a process gif, because I wanted to show as many steps as possible. I started with a rough sketch. Then I lowered the layers opacity and did a second a bit more accurate sketch. Under this sketch I started painting the skin with rough brush strokes. Once I felt that I placed most of the shades I merged the layer with sketch. Normally I wouldn't do this, but this was to save a bit of time. To make the features more clear without having to render for a long time. In retrospect, I should have colored the outline into a dark skin tone shade, instead of leaving it black. The following step is still somewhat new to me. I use a mixer brush to smudge all of the colors together. The result is quite blurry, but this makes it easier to add more details on top. I left out red color and the hand until the head was done. This red is a very saturated strong color, so mixing it with the head layer would make it very hard to fix any mistakes. One of my main mistakes was the eye, I started with much smaller eye than it should have been. However, because I compared painting's thumbnail to the photo, I realized the mistake and easily corrected it. Looking at the photo zoomed out, is one of the most important, but easy tricks. Painting the roses was very fun and interesting, so I saved more progress pictures for one of the roses as you can see above. I started with 100% saturated brush and placed the important reds in their places. Then I interchanged between 50% and 90% saturated brush, to blend and add more shades. This worked out well, but it's crucial to keep looking at the reference and pay attention to details. The small subtleties add realism to the painting, but it's best to do them last. For the hand I used a little different approach. I give it a more realistic look, I focused more on the crevices and the texture. I could have worked more on the study, but given my little spare time I try to stick to a schedule. I am satisfied with the result and might get back to this to push the realism a little more. I payed most attention to the roses and the eye, because those are the most intriguing parts for me. I have always loved mystery and subtle horror. 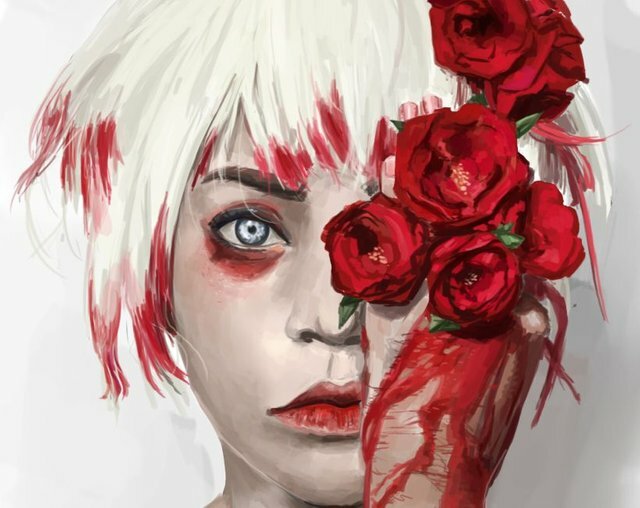 In the end I realized that the blood red roses and the cold blue eye are what attracted me most to the original photo. Strong contrast in color and saturation as many of the colors from my previous works are rather solft bland. The pale complexion of the person adds to the haunted and unnatural feeling. Wow this is fantastic! I've never expected it would also inspire you to write a short story, too! I am glad that you were able to practice your skills in digital painting and how you think about new ideas! Thank you so much for the great appreciation with my photo, too. I've never expected this to have a huge impact to others. 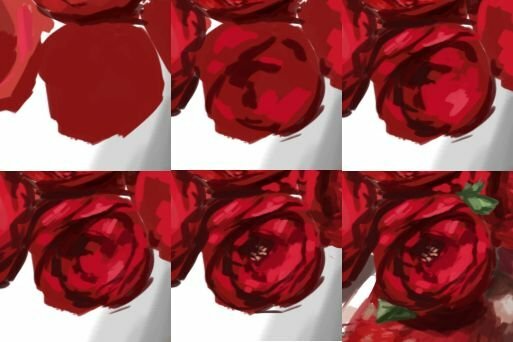 Your style with digital painting is also awesome! I love how you explained and creatively showed the steps through GIF. It makes it more interesting! For the writing: I want to learn to write simple stories that I can illustrate, so this was a nice way to start practicing. I prefer illustrated books over comics. This is great! You captured her very nicely with your rendition, both story and art wise. And it’s very thoughtful of you to share the rewards with her, I have nothing but praises for you. Well done. There is too much corruption and theft on Steemit, at least we can set a better example and maybe inspire others to try to be fair! A very ladylike behaviour indeed 👍! 🎉 Congratulations @kristyglas! 👏, your amazing Artwork has been selected to be featured in my curation post. Amazing artwork. And I also like your story, especially because you used present tense. It can pull the reader inside of the story so deep. Steem on. Painting and photography is beautiful and if only by seeing it, it makes inspiration flow through the veins. Amazing work. I also love the story.